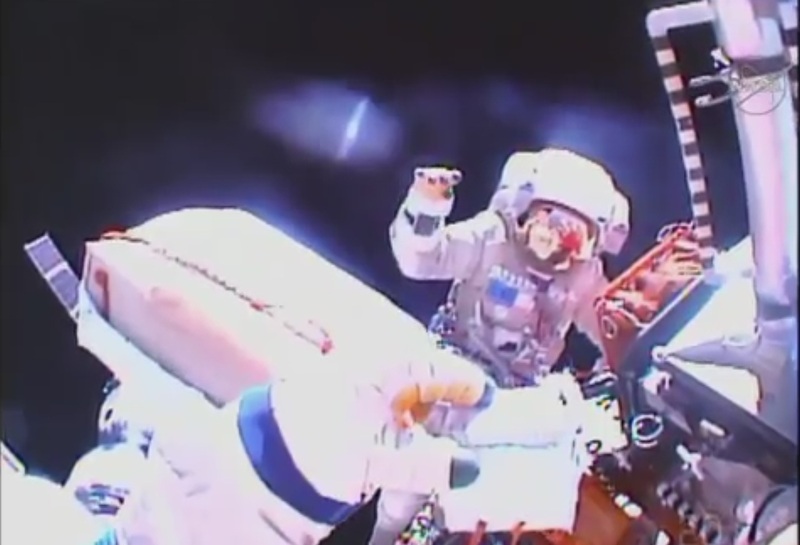 A duo of veteran spacewalkers ventured outside the hatches of the International Space Station on Wednesday in a busy EVA dedicated to the retrieval and installation of external experiments on the Russian Segment of the orbiting laboratory. Cosmonauts Yuri Malenchenko, a sixth-time spacewalker, and Sergei Volkov, now with four career EVAs, spent four hours and 45 minutes outside, completing all tasks that had been outlined for Russian EVA-42. The spacewalking duo successfully retrieved the EXPOSE-R astrobiology experiment that exposed a number of samples and experiments to the space environment for one and a half years. They collected another space exposure experiment and installed a new one in its place, deployed a materials science payload, configured a plume-sensing payload and installed gap spanners on the Russian segment, also collecting surface samples from different areas and taking engineering photos of various areas on the aft segment of ISS. The two ended their EVA with an experience-gathering exercise in a technology demonstrating involving the in-space application of adhesive surface coatings. Wednesday’s EVA was preceded by several weeks of preparations involving the Orlan-MK #4 & #6 space suits and the Pirs airlock that had to be converted from an ISS module to its role as EVA airlock, requiring the hatches to the Progress spacecraft currently docked to Pirs to be closed and EVA equipment to be installed inside the module. The two veteran spacewalkers also went through their procedures and prepared checklists for use during the excursion. On Wednesday, both crew members got up bright and early at 6 UTC to press into final EVA preparations. They activated their suits and completed a final set of checkouts before sealing off the Pirs module and ingressing their Orlan suits for leak checks and a one-hour pre-breathe of pure Oxygen. 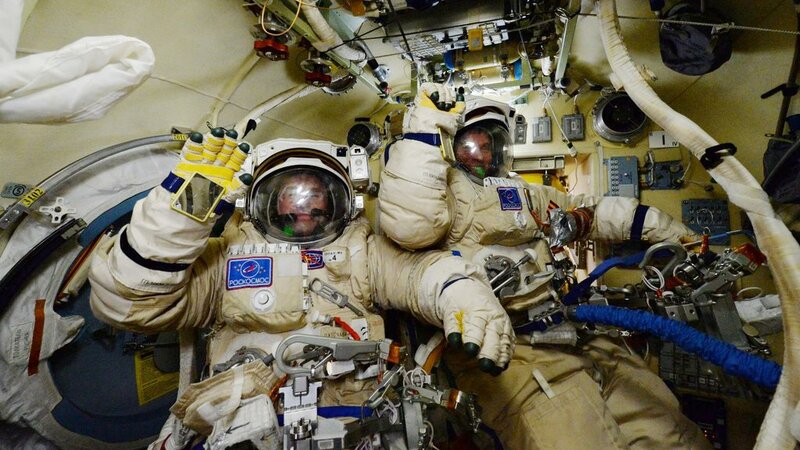 Depressurization of the Pirs airlock was started slightly ahead of the timeline and the two Orlan space suits showed good leak checks, allowing Malenchenko and Volkov to switch their suits to battery power and radio communications. 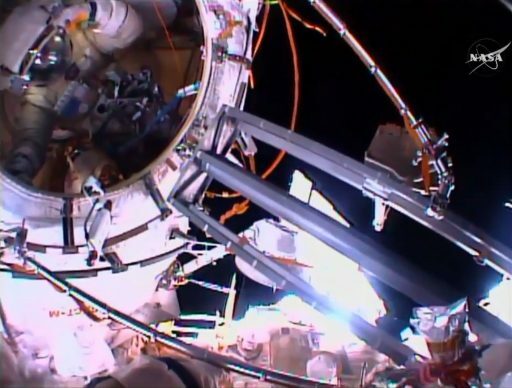 The EVA formally began at 12:55 UTC when Sergei Volkov opened up the hatch of the airlock, marking the start of the 193rd spacewalk in support of ISS Assembly and Maintenance. 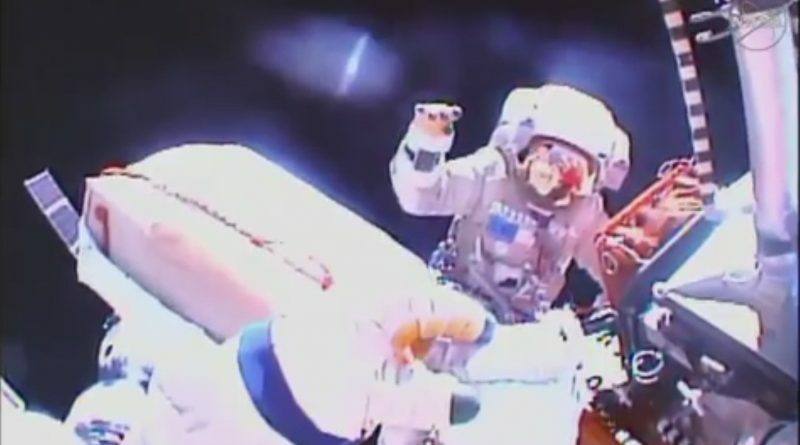 Both Cosmonauts were well accustomed to spacewalking as Yuri Malenchenko can look back at two decades of EVA experience, having performed his first walk in space back in 1994 on the Mir Space Station. Sergei Volkov performed three prior EVAs during his long-duration missions aboard ISS in 2008 and 2012. Embarking on Russian EVA-42, Sergei Volkov fully opened the hatch and installed a protective ring in the hatchway before climbing out onto the EVA ladder just outside Pirs where he set up his tethers. 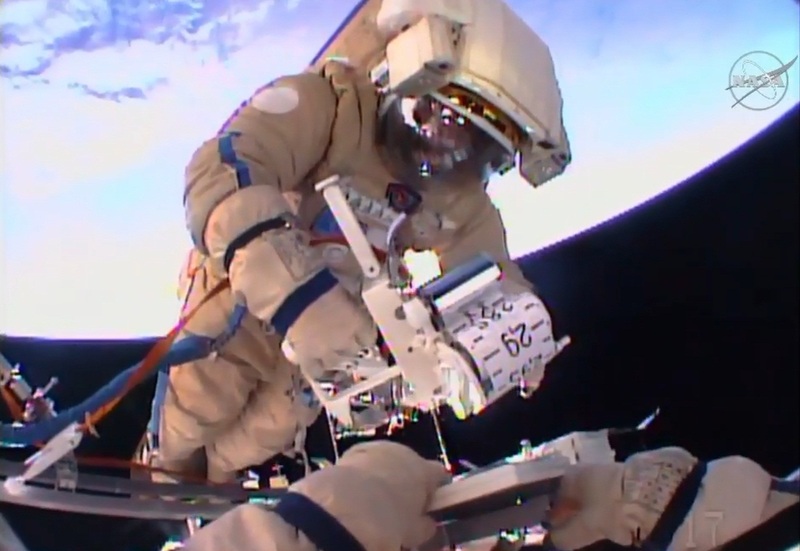 Still inside Pirs, Yuri Malenchenko started EVA procedures with the ‘Test’ experiment that uses swab sampling devices to collect samples from external ISS surfaces for return to Earth and laboratory analysis. He used a pair of swabs to gather samples from two areas on the hatch of Pirs. Meanwhile, Sergei Volkov got set for the jettisoning of a bundle containing a flash drive holding video messages from last year’s 70th anniversary celebration of Victory Day. 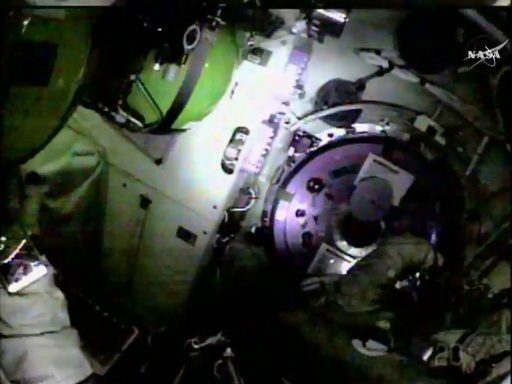 Malenchenko, still inside the airlock, positioned video cameras to document the symbolic release of the bundle occurring at 13:22 UTC when Volkov threw it into a retrograde direction to enter an independent orbit and re-enter in a period of only a few months. 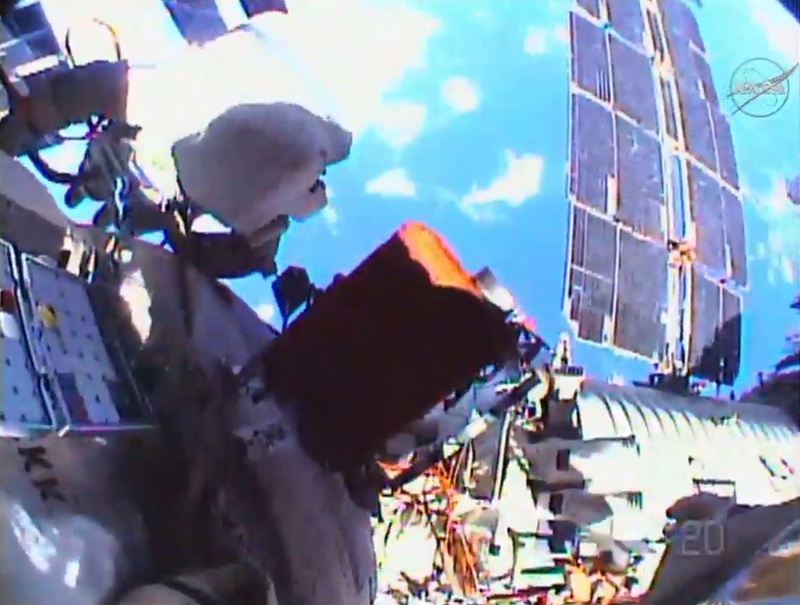 Video from Volkov’s helmet camera showed the bundle drifting way from ISS, flying high above South America. 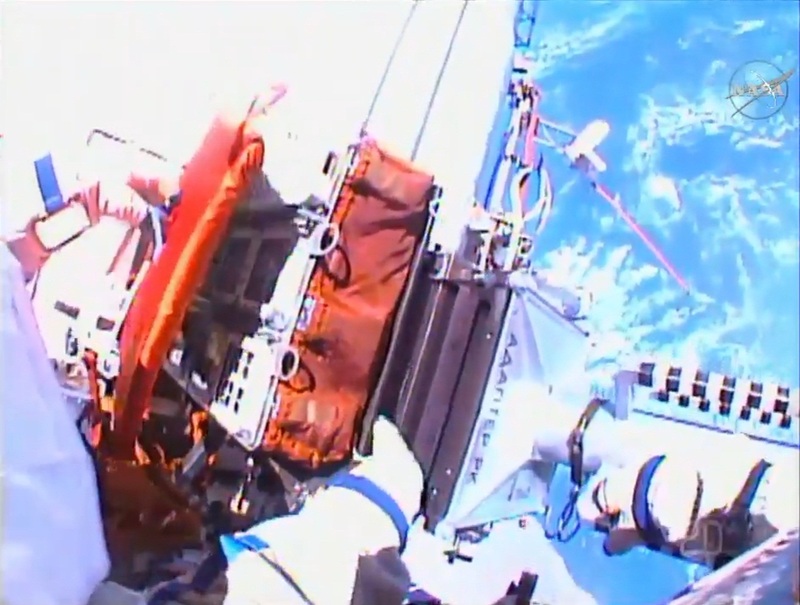 Next for the crew was a short translation over to Window #8 on the Zvezda module where they again used ‘Test’ to acquire swab samples from the window cover drive mechanism. The Test Experiment aims to obtain swab samples from the various surfaces on the exterior of the Space Station to study weathering of different materials in the space environment characterized by harsh thermal variations, high doses of radiation and atomic oxygen causing corrosion. Samples collected from the various surfaces and areas are returned to Earth for laboratory analysis to point to any substances that may be accumulating on the windows (propellant residuals and other substances) or show any signs of corrosion on the window shell or even microbial activity. 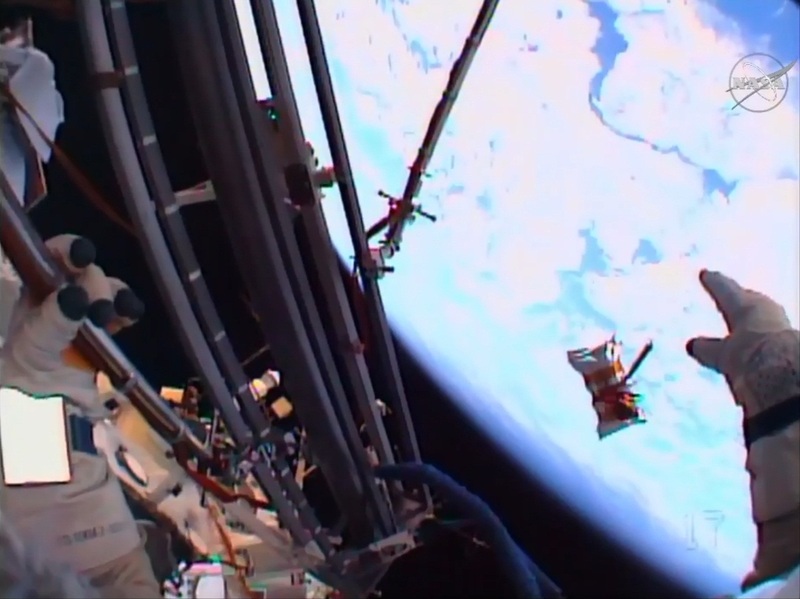 The samples were returned to Pirs and the crew headed on towards the large diameter of the Zvezda module, specifically the URM-D Universal Work Platform on Plane II where the EXPOSE-R experiment resided for the last seven years. EXPOSE-R, one of several space exposure experiments hosted aboard ISS, was first installed in 2009 and over the years, had its payloads replaced multiple times. 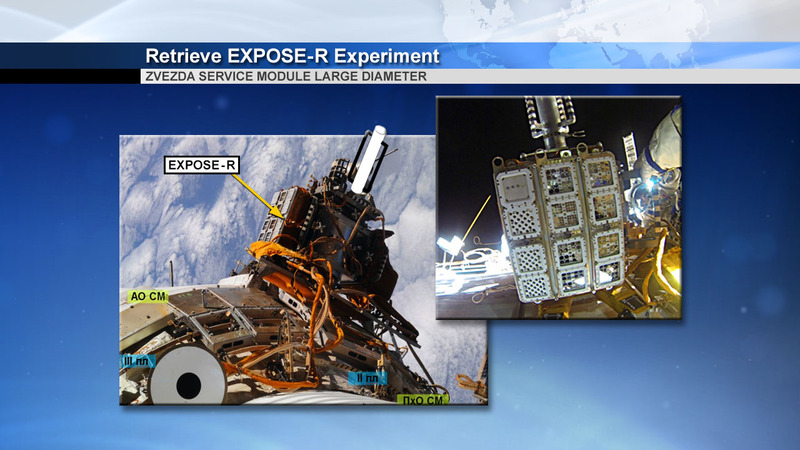 The EXPOSE-R #2 experiment was installed back in August 2014 by Cosmonauts Oleg Artemyev and Aleksandr Skvortsov for a one and a half-year exposure to the space environment. Before touching the EXPOSE-R monoblock, the spacewalkers collected plenty of engineering footage showing the condition of the samples. 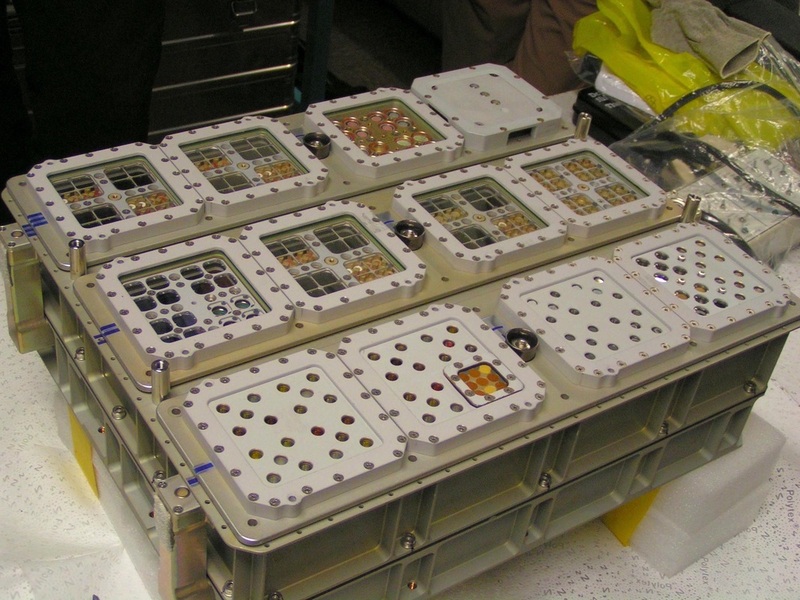 Then, they installed a cover plate atop the samples using wire ties on all four corners to secure the cover and protect the payload when being transported back to ISS. Opening up the FP-20 connector patch panel, the crew disconnected the 20-2 and 20-3 cables that were used to deliver heater power and data connectivity to the payload to log the environment the samples endured. 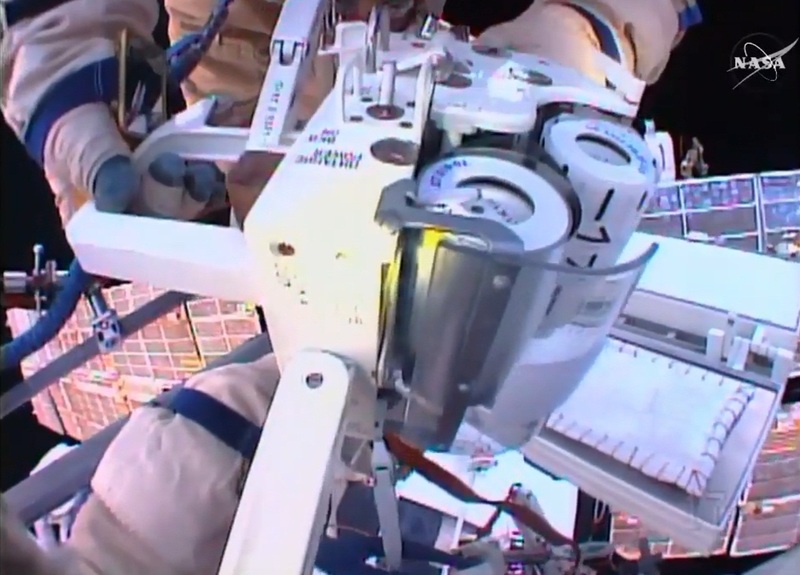 The crew structurally demated the EXPOSE-R monoblock from the URM-D and they tethered it to their suits for the translation back to the Pirs airlock. The EXPOSE payload platform was developed by the European Space Agency to conduct astrobiology studies by exposing samples and experiments to the space environment – mounting the platforms on the exterior of ISS for an extended period of time before retrieving them for return to Earth. The effects of the space environment (increased UV exposure, cosmic radiation, microgravity, atomic oxygen, temperature variations) on organic matter and organisms have been heavily studied via space-based experiments and in ground-based laboratory simulations. These studies are performed to better understand the role of interstellar, cometary and planetary chemistry with respect to prebiotic molecules leading to the formation and evolution of life on Earth, also assessing the possibility of its distribution in space. EXPOSE-R2 launched aboard Progress M-24M in July and will remain installed on URM-D II for up to 18 months. The experiment module hosts four experiments – BIOMEX, BOSS, PSS and Biochip. Back at Pirs, the crew dropped off EXPOSE-R and retrieved a pair of exposure payloads to be deployed next as well as two soft handrails or gap spanners to be installed on Zarya. Making extremely efficient work, lead spacewalker Malenchenko and EV-2 Volkov had jumped well ahead of their timeline when making their way up the deployed Strela boom to reach the Poisk Module for the next tasks. On handrail 6032, the spacewalkers found the CKK 2-M2 experiment cassette that had been deployed back in 2014 to expose samples to the space environment. 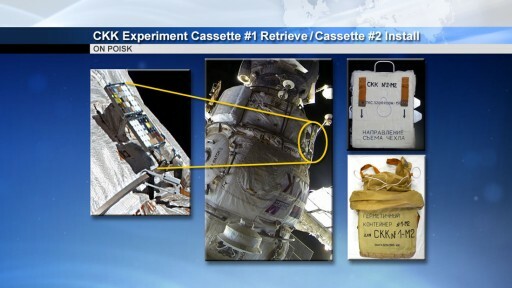 They were tasked with closing up the suitcase-like payload to protect the samples and demate the CKK cassette from the stanchion for return to ISS inside a protective bag. 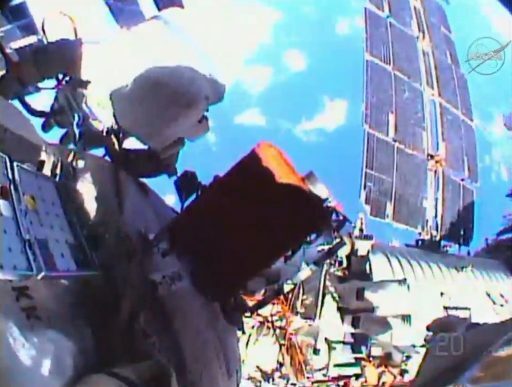 In its place, the crew installed the CKK 3-M2 experiment for its stint on the exterior of ISS, folding up the two halves of the suitcase-like device and securing it in place. The objective of the study is to measure the level and composition of contamination on the materials and monitor the changes in operating characteristics in the materials as a result of exposure to the space environment. Data from CKK will help develop and chose materials for future space-flight components to be used in the construction of spacecraft. 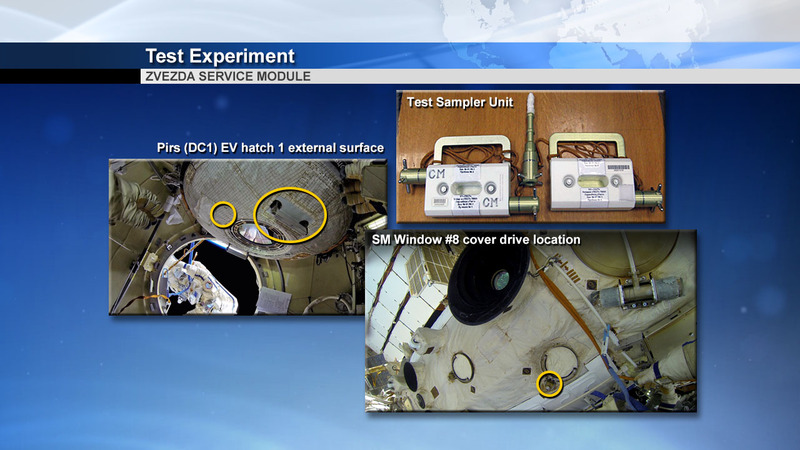 Analysis of the exposed samples is performed on Earth after the CKK containers are returned aboard Soyuz spacecraft. After making quick work with the CKK swap-out, the spacewalking duo worked equally fast when rotating the Plume Impingement and Deposit Monitoring Unit БКДО to view a different sector in its ongoing study of of the plumes created by the thrusters of visiting vehicles and the Space Station itself to learn more about the impingement characteristics of the thruster plumes and processes causing the deposition of combustion products on the external hull of the space station. 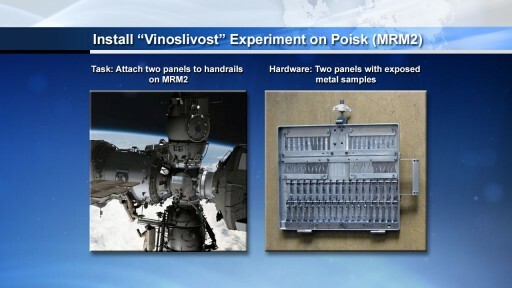 The next task for the crew was to translate around the Poisk module for the installation of the Vinoslivost payload, another space exposure experiment that also comes as a panel, holding the various experiment samples and attaching to a handrail stanchion. The Vinoslivost study is similar to the US MISSE experiment and looks at the performance of different materials under the harsh conditions of space – the increased UV radiation from the sun, cosmic radiation, the extreme and sudden temperature changes when moving from day to night, and atomic oxygen leading to rapid corrosion. The core objective of the Vinoslivost study is to determine the effect of space environment factors on strain, strength and fatigue characteristics of materials in loaded and unloaded configurations. The experiment consists of panels that facilitate the different materials for exposure to space. After a pre-determined amount of time, the panels are brought back to the inside of the spacecraft for return to Earth to allow in depth-study of the materials. 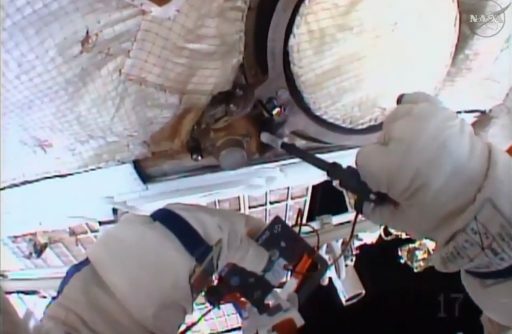 To complete the penultimate task of their spacewalk, the Cosmonauts translated down to the PKhO/Zarya interface to install a pair of soft hand rails or gap spanners between handrails to help future EVA crews when translating between the forward and aft segments of the Russian section of ISS. The two gap spanners were installed between handrails 1504 – 1335 and 1505 – 1335 without any issues and the spacewalkers collected engineering photos of Zarya before making their way back to the airlock for the Restavratsiya experiment. 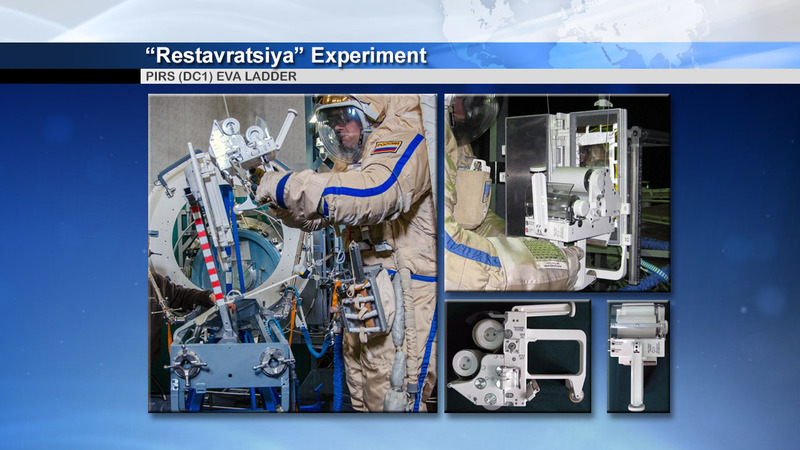 Based on the EVA ladder, the crew retrieved the “Restavratsiya” (Restoration) Experiment Hardware – a plate-type device with several pages holding material samples, and a surface treatment device to test out the in-space application of a thermal protection foil to a surface using an adhesive. The experiment looks at unique characteristics associated with the application of surface treatments in space such as thermal coatings, films and glues. The study evaluates a device designed for the application of a thermal protection foil on surfaces using an adhesive to cover repaired or reconditioned components for future operational use in space-based repairs of external equipment. While Yuri Malenchenko used the device to apply the thermal foil to the plates, Sergei Volkov gathered video of the procedure for evaluation on the ground along with the returned hardware. The crew had to make quick work in setting up to complete the experiment run in sunlight to capture good video of the activity. The reference plate was comprised of over a dozen pages, each with a different material to test the surface treatment device on a number of different surfaces typically found on the exterior of spacecraft such as thermal protection foils, MMOD protection fabric, different metals and synthetic materials. 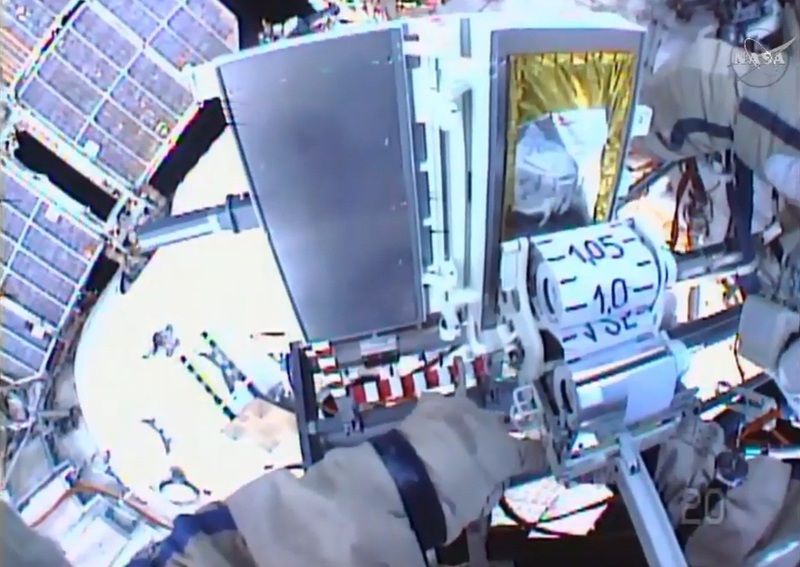 Midway through the experiment run, the device jammed with tape – requiring Malenchenko and Volkov to work on their feet and quickly troubleshoot the problem to complete the task in daylight. They successfully covered the vast majority of the pages and packed the device up to return to ISS while the reference plate remained outside to be exposed to the space environment for some time in order to learn how the applied coatings will fare in the extreme environments in Low Earth Orbit. To call it a day after a very successful EVA, the two Cosmonauts completed an inventory of equipment and tethers before Yuri Malenchenko again ingressed the Pirs airlock, followed by Sergei Volkov who then removed the protective ring and closed the airlock hatch, marking the end of EVA-42 after four hours and 45 minutes. Pressurization of Pirs began a short time later and leak checks confirmed the integrity of the hatch seal – also allowing Scott Kelly and Mikhail Kornienko to move out of their isolation in the Poisk Module. To allow the PKhO Transfer Compartment to be used as a backup airlock in case of problems with Pirs, Kelly and Kornienko isolated themselves inside Poisk about an hour ahead of the end of the EVA to have access to their Soyuz spacecraft in case of any serious issues. Wednesday’s EVA was the third for ISS Expedition 46, the second of 2016 and the first Russian spacewalk of the year. Yuri Malenchenko now has 34 hours and 50 minutes of career EVA time on six spacewalks using Russian and American space suits. Sergei Volkov, now with four EVAs, increased his record to a total EVA time of 23 hours and 20 minutes. The next ISS spacewalk will be a U.S. Stage EVA dedicated to the continued efforts in readying the Space Station for the start of commercial crew traffic. The next Russian spacewalks are on the books for the summer time frame.